A new type of electronic noise has been discovered by a team of physicists and chemists in Israel and Canada. Dubbed “delta-T noise”, the effect occurs when two sides of a tiny electrical junction are at held at different temperatures. As electronic devices become ever smaller, the researchers predict that delta-T noise could become increasingly problematic. The good news is that delta-T noise could be used to measure temperature differences in nanometer-scale objects – something that is extremely difficult to do. When physicists think of noise it is not the clamor from a pop concert or a busy road, but rather electrical signals that are an intrinsic property of a device. 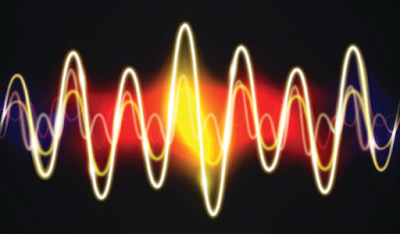 For almost 100 years, physicists have known about two sorts of fundamental noise in electrical signals. Thermal noise is proportional to temperature and is a result of the random motion of electrons. This creates fluctuations in electrical current even if there is no applied voltage and the average current is zero. Thermal noise can have negative consequences in a circuit, but it can also be used to measure the absolute temperature of an object. The second type of noise is called shot noise and does require an applied voltage. Shot noise occurs at very low currents when the discrete nature of electrons causes fluctuations in current. The idea of delta-T noise first came to Oren Tal of the Weizmann Institute of Science when he was studying the effect of thermal noise on a molecular junction. The junction comprised a single molecule between two electrodes, which were at different temperatures. He realized that in addition to thermal noise, there may also be a noise associated with the temperature difference.